Was Vlad the Impaler Bram Stoker's Inspiration for Dracula? Was Vlad the Impaler Bram Stoker’s Inspiration for Dracula? 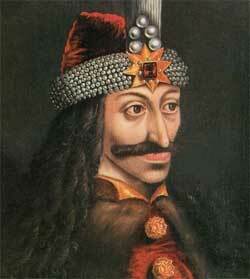 If you’ve read anything about Dracula, you’ve probably heard of Vlad the Impaler. But chances are, Bram Stoker didn’t know much about this legendary Romanian. Paranormal investigator Massimo Polidoro describes his search for the historical Dracula for a Discovery Channel Europe tv show over at lifescience.com. If you’ve read anything about Dracula, you’ve probably heard the name Vlad Tepes or Vlad the Impaler associated with him. But while there are a few similarities, there’s a good chance that Bram Stoker didn’t know much about this Romanian hero. Bram Stoker’s Dracula (published in 1993) wasn’t the first vampire story published. Most cultures have some kind of vampire lore. And the vampire in literature trend started a good 80 years before Stoker with ‘The Vampyre’ by Jon Polidori, Varney the Vampyre (1847),and Carmilla (1871) by J. Sheridan Le Fanu. Vlad the Impaler had quite a reputation as a vicious tyrant and madman who drank the blood of his enemies. Stoker probably chose the name ‘Dracula’, Vlad’s surname, because he thought it meant ‘son of the devil.’ Actually, the name means ‘son of the dragon’ because Vlad’s father was a member of the knighthood Order of the Dragon. But to many Romanians, Vlad is a national hero, a saviour. They reject the tales of a psychopathic tyrant as vicious propaganda promoted by Vlad’s enemies. They honour him as the legendary king who, like Britain’s King Arthur, will one day return to save his country. Part of the reason for this lies in places like Sigihisoara, a town built by Germans, or better, Saxons, who had moved to Transylvania to become merchants. They took hold of the region and didn’t even let Romanians enter the town-they had to pay a toll first. Vlad resented this and sided with the Romanians. In his lifetime, he also fought bravely against the Turks, who had conquered parts of Europe already, and this spread panic among the Christian kings. So Vlad was considered a crusader. Europe, then, first knew him as a hero. I’ve blogged previously about how vampires are still a reality in Romania. Polidoro recounts an incident from 2004 where a local family dug up the body of what they thought was a vampire (called strigoi). Six local men then volunteered to enact the ancient Romanian ritual for dealing with a strigoi. Just before midnight, they crept into the cemetery on the edge of the village and gathered around Toma’s grave. It seems that the destruction of a strigoi has some parallels with the methods used by Stoker’s heroes to destroy Dracula. But rather than drive a stake through the creature’s heart, the six men dug Toma up, split his ribcage with a pitchfork, removed his heart, put stakes through the rest of his body, and sprinkled it with garlic. Then they burned the heart, put the embers in water, and shared the grim cocktail with the sick child.